Combine the parsley, basil, mint, sage, rosemary, thyme, chile pepper, garlic, and oil in the bowl of a food processor. Pulse in spurts until well combined, then add the sugar, almonds, and cheese. Process very briefly, just to mix well—the almonds should not be over-processed. Taste, and add salt if necessary (there may be enough salt from the cheese). Bring 5 to 6 quarts water to a rolling boil. Add salt, and when it comes back to a boil, cook the pasta in the boiling water. 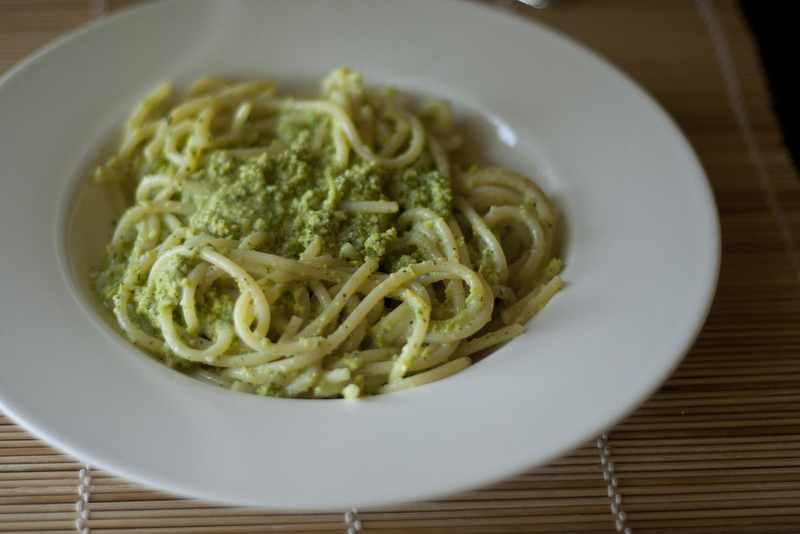 When the pasta is almost done, extract a ladleful of pasta water and add to the pesto to thin it slightly. 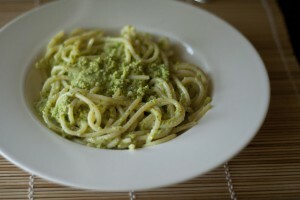 Drain the pasta and mix it with half the pesto, then turn it into a warmed serving bowl or platter. spoon the rest of the pesto over the top and garnish with the diced tomatoes. Serve immediately.